← awesome four-cheese macaroni and cheese … and it’s gluten free too! This is Geoff’s mother’s recipe for enchiladas – straight from Yuma, Arizona. Serve these on a hot summer’s day with Spanish rice, refried beans, a tossed salad, and, of course, a gluten free beer. They taste absolutely fabulous and the whole meal takes less than 30 minutes to prepare! One of our all-time favorite meals, we were finally able to convert it to gluten free with our potato flour tortillas. Grease the bottom of a 9″ by 13″ casserole. Spread three tablespoons of sauce over the bottom of the pan. Stir another three tablespoons of sauce in with the ground beef, steak, chicken, or vegetables to make the filling. Put two to three spoonfuls of the filling mixture onto a tortilla and sprinkle with cheese. Roll in half like a taco and lay on its side in casserole dish. If needed, pin the enchilada closed with a toothpick. Repeat for all eight. Pour the remaining sauce over the top of the enchiladas, sprinkle with jalapeno peppers and any left-over filling, and top with the remaining cheese. Cover and bake for 20 minutes or until the cheese is melted and the enchiladas are heated through. 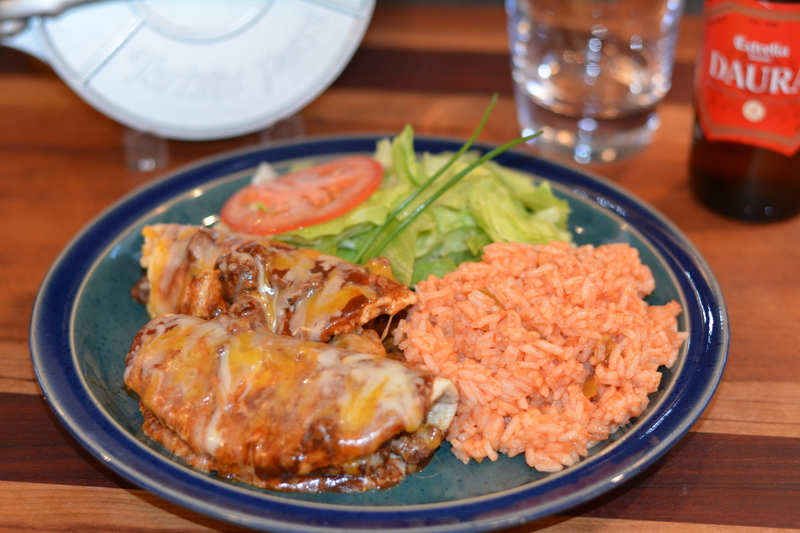 This entry was posted in Lunch and Dinner, Recipes and tagged beef enchiladas, chicken enchiladas, enchiladas, gluten free in Red Deer, gluten free Mexican recipes, potato flour enchiladas, vegetarian enchiladas. Bookmark the permalink.